That quip gave me a little comfort when chuckles emerged during Herzog’s newest film, Queen of the Desert. This film is an astonishing miscalculation and all the chuckles feel, sadly, correct. Herzog’s subject, Gertrude Bell, deserves a great film but Herzog blunders almost every aspect of her biopic; from the casting, to the pacing, to the music, to the story focus—and hell, even his font choice for the credits and prologue—this might be biggest blight on the auteur’s filmography. As he’s given us so many fictional and non-fictional cinematic treats, I’d like to offer him a mulligan. I’d even love to see him try again, because Bell deserves something that looks, sounds, and acts better than a History Channel narrative that happens to have real-life movie stars. The History Channel feel begins with the opening credits, in which Herzog briefly summarizes Bell’s importance (as being called upon by Winston Churchill to provide new national borders for the Middle East, after being one of the only Westerners who traveled through Arabia); he then flashes a photo of Ms. Bell “at age 26.” Nicole Kidman plays Bell from 26 to age 50ish, but for half of the film she is aged 26 to 30, which is very distracting since Kidman is nearly twice Bell’s age for a majority of Queen of the Desert. One doesn’t want to call attention to Kidman’s age, but Herzog bizarrely does so by placing an age title card and then a digital segue from that photograph to Kidman complaining of not having enough excitement or responsibility after graduating at the top of her class at Oxford. Coming from a hugely influential estate, Bell is trotted out as a possible marrying partner by her parents, and Kidman is not directed as a young woman who’s not seen any of the world before, she’s directed and performed as a fully-formed woman who has already seen it all and done it all. As performed by Kidman, Bell curiously seems passionless about her passion to see the world. Her cousin, Florence (Holly Earl), is introduced as a naive and a romantic rival to Bell for any potential suitor. But Kidman is obviously 20 to 25 years older than Earl and they are presented as being within the same aged ballpark; this is an absurdly comical miscalculation by Herzog, but, many years later, when Bell should look hardened by the years of sand blasts and months of captivity within an Arabian harem, Kidman still does not fit the part, for she’s pearly, soft, and still passionless. If that sounds like a superficial complaint (it is incredibly distracting as you’re unaware if Herzog is playing these age games with anyone else she encounters), Herzog himself treats Bell superficially. 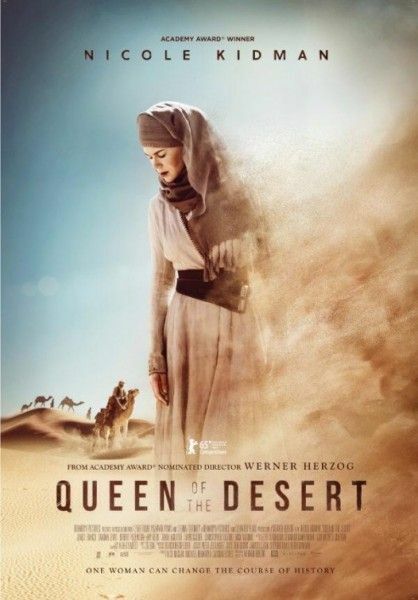 In Queen of the Desert, Bell is presented less a woman who engaged with cultures that discounted a woman’s ability to have adventures (both in Britain and in the Middle East) and more as a woman who had tough luck with love. Bell meets her first suitor in Tehran. He’s a junior diplomat and he’s played very irksomely by James Franco (all squints and no accent). Also passionless, Franco isn’t given anything meaty from Herzog the screenwriter. He begrudgingly has to try to sell such corny lines as, “Many a man has fallen in love with a smile without falling in love with the rest of her,” as a way to get to disrobe “the rest of” Bell. Bell’s father doesn’t approve of her potential marriage to the junior diplomat and so Bell decides to wander the desert apart from the expectations of her estate. In real life, 1868-1926, Bell was someone who cast aside centuries of gender traditions on her own terms. Here she is reduced to “a woman who just misses her man.” That is an exact quote of how she responds in Herzog’s film when an Arabian guide commends her bravery. Bell’s man-missin’ also complicates her potential relationship with a married army man (Damian Lewis), who is less respectful of her one-man-only feelings than T.E. Lawrence (Robert Pattinson), an anthropologist who’s attempting to remain single despite all the Arabian offers from a nearby camp. As a military man who finds Bell’s thirst for adventure invigorating to see in a woman, Lewis is the only actor who seems natural in his role. 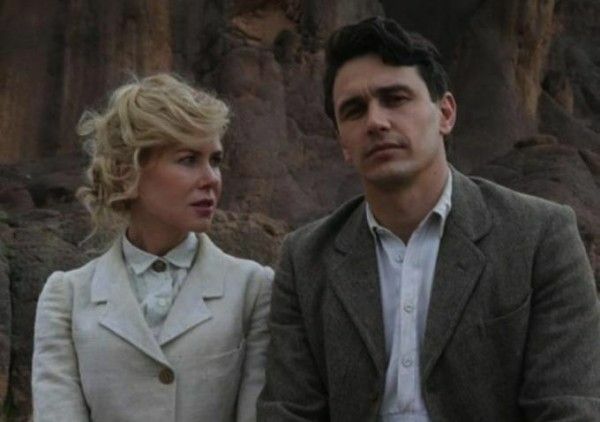 Franco and Kidman are phoning in their most typical of performances and Pattinson (who’s admittedly been great in The Rover and Cosmopolis) plays Lawrence of Arabia like a beatnik poet playing dress-up in the desert. As a romantic melodrama, Queen of the Desert does a disservice to Bell’s story, but that could have been passable if there were sparks and gestures with big feelings. Herzog does not generate any heat between any of the leads and Bell seems to get along more magnificently with her camel and her guide than the men in her life. That itself should’ve informed Herzog where the heart of this story is: not in letters home, but connection to the actual desert. Herzog has made so many great films in his career that when we see an unmitigated disaster such as this, some may assume that he’s somehow in on the joke. The big sweeping score that repeats every time Bell walks up a sand dune, and the “gee, I just miss my man” reduction of her character are surely hints at how melodrama reduces true life stories of interest to mere soaps of Team Franco or Team Lewis, right? Right? Herzog couldn’t just flub it outright this badly, could he? I think he does. 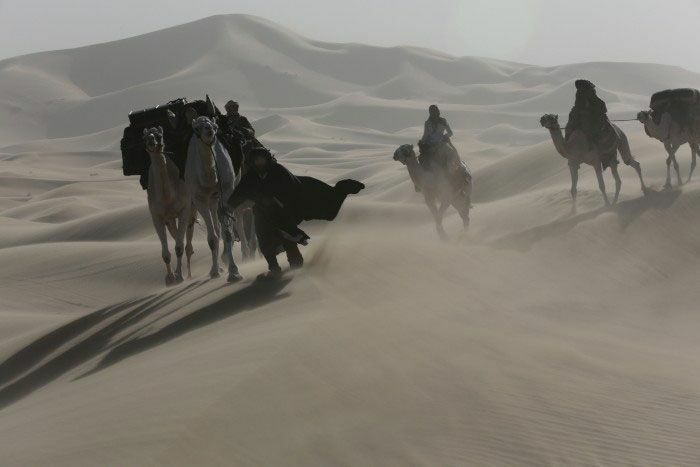 There are no hints of cheekiness or self-awareness in Queen of the Desert. Indeed, there is an earnestness to Queen of the Desert, and it exists in the prologue. We do feel that Herzog truly does respect what Bell did, and loathes how the British undermined her informed wishes, by chopping up the Middle East more than she had recommended (and even took back posts that she had requested and promised). These factoids (including a slight condemnation of Churchill) show that Herzog is aware that there is a meaningful line to draw from Bell’s womanhood and how men of power disregarded her first person intel on regions that they never ventured too far into. And how, in this instance, that has created border wars that we’re still dealing with today. For some reason, Herzog didn’t make that movie. I, for one, would be open to seeing him try again. Perhaps that’s an odd request, but what’s the harm? I don’t think it’d be possible for him to fail as hard as he does with this one.